Spending Christmas with my better half's family allowed for plenty of opportunity to check out the beer scene in Glasgow and this culminated in a small pub crawl on our last night. 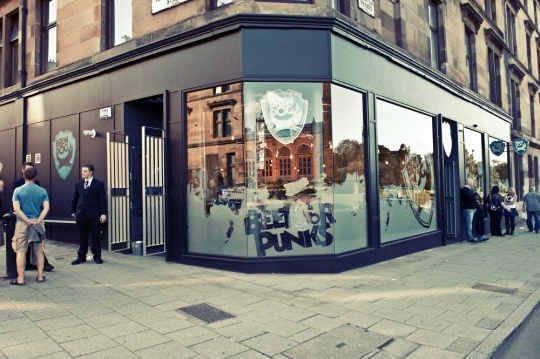 The West End of Glasgow has become something of a beer geek destination in 2011 with this Summer's opening of Brewdog Glasgow and more recently Bruadar Bar adding to the already excellent Bon Accord and Three Judges. 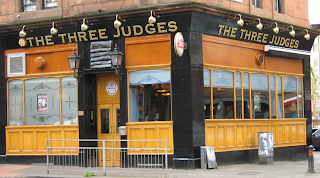 The four pubs are within about a mile of each other along Argyll St running from the M8 crossover from St Vincent St down to Partick Cross. 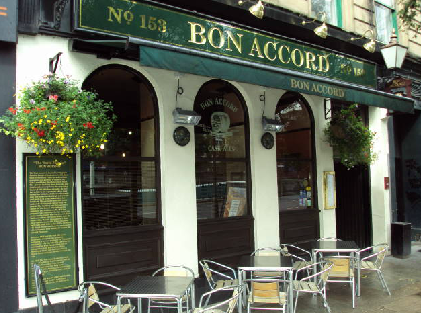 We started in the Bon Accord, a welcoming and traditional boozer which has around 10 hand pulls and quite a few keg lines. The keg lines featured the usual crowd pleasers with cask featuring a good range of beers from Scottish and English brewers, many of which were of a festive ilk given the time of year. Between us we went for a Harviestoun Schiehallion and a Fuller's Black Cab Stout, both of which were on good form. From there, a short taxi ride (well, it was raining!) took us to the Brewdog bar opposite the beautiful Kelvingrove art gallery, which was lit up red by the festive lighting. Brewdog, the Fraserburgh based craft brewer opened this, at the time their third bar, back in July 2011. It continues the theme of being an industrial type space with exposed metal and brickwork but despite this is still warm and welcoming. The staff in here were as always passionate and keen to showcase the beers on offer. We opted for a 5am Saint and a Punk IPA, the former being on great form despite being a keg end topped up from a new keg. I didn't think the latter was quite at its best (lacking some of its usually copious tropical fruit notes in the finish - short of the outstanding form it was in at their Camden bar last week). Next, we moved on to a Stone collaboration stout and a bottle of Stone's ruination to really kick start proceedings. We would've got stuck in to the Lagunitas beers they had on tap but had already been through them all on Christmas Eve! A lot of credit must go to Brewdog for the guest draft and bottle selection on offer - something they've carried across all of their bars and long may it continue. Leaving here, we walked down the hill to the Three Judges at Partick Cross (a five minute walk) where wet met up with the very knowledgeable Beer Monkey. This is a fantastic 'local' boozer with 10+ hand pulls and as many keg lines available along with fridges full of a varied bottle selection. Like the Bon Accord, the festive ales were out in force and we tried offerings from Williams Bros and York Brewery, both of which were decent. Our final stop was just over the road - the newly opened Bruadar Bar. We'd been in here a couple of days prior to eat and found the burgers to be delicious and good value. Tonight was all about the beer however and the selection was able to satisfy our thirst with beers from Magic Rock, Tempest, Lovibonds, Durham and Black Isle all being available on the bar. We opted first for a Magic Rock Curious NZ, a beer I'd first tried at the Cask Pub & Grill in Pimlico. I had intended to write a blog about that night (a 'meet the brewer' event) but didn't get round to it. One takeaway for me though was the importance they attached to social media when talking about their meteoric rise to becoming one of the superstars of the UK's up and coming craft beer movement (the latter being my words - the lads at the brewery are far too humble to even suggest such a thing). Just as we'd finished our first pint here, Rouge Hop from Summer Wine Brewery came on the bar. This is a lush, hoppy red ale with a fantastic bitter finish and made our minds up for us easily. The evening finished with a half of Lovibonds fantastic 69 IPA, on its first outing north of the border and something of a coup for a bar which has a lot of promise. In a few short hours, we'd sampled excellent beers from Scotland, England and the USA and had the chance to try many more had time been on our side. The West End of Glasgow is certainly worth a visit as a beer destination and that's before you explore everything else the area has to offer. Better late than never, Andy. Welcome to the wonderful world of beer blogging. Thanks Kenny. I'll try to make up for my tardy start by posting regularly!